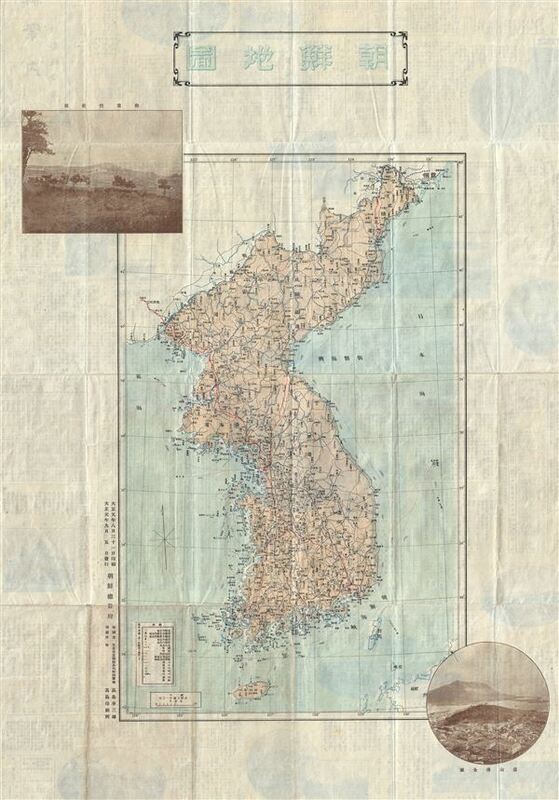 This is a scarce 1912 or Taisho 1 Japanese map of Korea (Corea). This map of Korea, made in the first year of Emperor Taisho's reign, covers all of Peninsular Korea. It details, roads, waterways, railways, shipping lanes as well as other topographical features. The map was prepared by the Japanese shortly after the 1911 Annexation. Includes a photograph of Busan or Pusan Harbor in the bottom right quadrant and another photograph of State Farm in the top left quadrant. Verso contains text and images. All text in Japanese. Issued by the Japanese in 1912. Very good. Some wear and toning along original fold lines. Minor spotting. Text and images on verso.